George Ogata founded the MIT Summer Philharmonic Orchestra (MITSPO) after 7 years as Concertmaster of the MIT Symphony Orchestra. Now in its 19th season, the MITSPO draws top amateur players from throughout the Greater Boston area to come together for a summer festival of music making. Violinist.com member and 2nd-year MITSPO violinist Karen Allendoerfer spoke with George about his experiences with the orchestra. Karen: When did you found the MITSPO, and what inspired you to do so? George: I founded the MITSPO back in 1995. I had graduated from MIT (the Massachusetts Institute of Technology) in 1992 with a major in Biology and a minor in music. 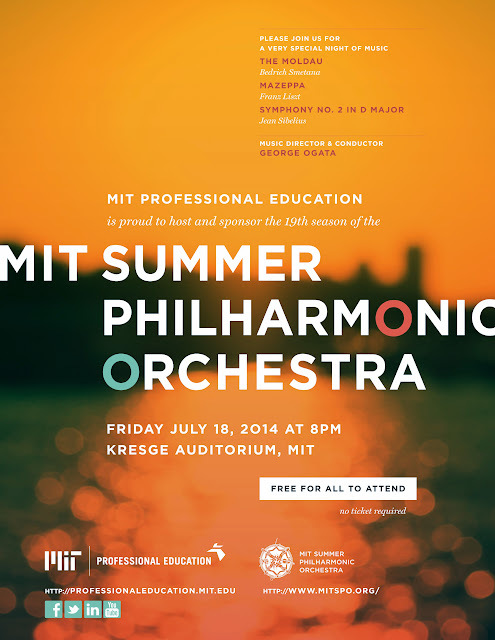 I was working as a software developer, and I was still playing in the MIT Symphony plus 4 other community orchestras. I loved orchestral music so much, every night of the week I was playing in a different orchestra. At MIT they have something called the IAP (Independent Activities Period), which is the month of January between the two semesters. During that time they have fun activities and short courses. Students can create an activity or a class. My senior year, I created a sight-reading orchestra during IAP. That was my first experience with conducting. I enjoyed it, and people enjoyed my conducting at the time. The MIT symphony meets during the school year, and there was interest among some of the other players in having a similar orchestra during the summer, so I was asked to create a summer orchestra like the ensemble I had created during the IAP. At first I thought it was an impossible task. Karen: What were some of the challenges in getting it started? George: To get funding, I approached two sources, the MIT Alumni Association (since I am an alumnus) and the precursor to what is now called MIT Professional Education, then called Summer Education. I asked them if they would sponsor a summer orchestra. They both said yes, and with these 2 sponsors, I was able to use Kresge Auditorium. Once I had funding, I had to create the orchestra out of thin air. But people knew me as the concertmaster of the MIT Symphony, and I had also met a lot of musicians through all those community orchestras. I approached people about my vision, and they were intrigued by the concept. I was on the phone all the time, recruiting. We had a full orchestra of 70 members on the first day. Karen: Why do you think it has lasted for almost 20 years? George: With each succeeding year, the reputation of the orchestra grew, and it became easier and easier to form the orchestra. Now it's not very hard anymore. The make-up of the orchestra even today is kind of a melting pot; with all the major community orchestras on a summer break, people are looking for a place to play. This orchestra is the cream of the crop, an "all-star orchestra." That makes it kind of unique. It's just during the summer months, one concert only. That makes it a special event that people want to participate in. Karen: You are also now conducting a new youth orchestra at Powers Music School in Belmont. George: A year after I started the summer orchestra, in 1996, I was invited by Longy Music School to audition for the conductor position of the Young Performers Chamber Orchestra, and I got the job. The founder of that orchestra was Roman Totenberg, who was President of Longy in the 1980s. It transitioned to be called the Longy Youth Chamber Orchestra. I conducted there for 17 years and took the orchestra on tour to France, Finland, Spain, Austria, the Czech Republic, Canada, and of course here in the USA. Then in 2013 the school decided to close down its community programs. Many of the kids from Longy wanted to continue playing and working with me, so I ended up talking with Powers Music School and they loved the idea. I founded a new youth orchestra there called the Massachusetts Youth Symphony Project. The seed for the new orchestra was the kids from Longy, but MYSP signifies a new force or a new initiative in the community. It is now a 3-orchestra program. I conduct the senior orchestra. Karen: You were a Biology major at MIT. Did you also study conducting? George: Yes, I studied with Dr. James Yannatos in 1995. He conducted the Harvard/Radcliffe orchestra. I also took some workshops and master classes with the Conductor's Guild. Dr. Yannatos was very influential in my approach to conducting and musical vision. He taught me efficient and concentrated use of the baton. Karen: Are there differences conducting kids vs. adults? George: Of course, kids have less experience. I will help shape their instincts a lot more, and get them used to working in an ensemble, not as individual performers, but as contributors to a whole. They have to learn a new mindset. Often the repertoire we perform is their first introduction to works in a particular style. So they have to get used to classical vs. baroque vs. contemporary playing. When I audition players for the orchestra, I'm not thinking, first, "is this person going to be a good orchestral player?" I am asking, "are they able to technically be proficient enough so that they won't be drowning when they play the repertoire?" Then, in the orchestra, I can shape their approach to playing, help make them more aware of the fact that they have to blend, but still have to put that same intensity into the playing. Karen: Growing up, you played the violin at a very high level and were also interested in and good at science. How did you end up at MIT instead of a conservatory? George: I knew I was never going to be at that high pro level. I played decently and I loved playing and I took the violin very seriously. But I had a late start, I started at 9 years old in the 4th grade. I never saw myself on a soloist track. I always felt most comfortable in an orchestra. At the same time I was very seriously interested in science and in high school I dreamed of going to MIT. I heard MIT had a great music department too. I knew that not only could I be studying Biology but could also study music at a high level. And the school made it very efficient to take classes and earn a music minor. Karen: How do you balance a career in the tech industry with a conducting career? George: Since 2000 I've been in project management. I am a Director of Development Process Engineering at Eze Software Group, working to establish best software development practices. I actually became a project manager through conducting. I was conducting at Longy, and also working as a software developer. The father of one of the orchestra students was at a software company looking for a project manager, and he saw in my conducting abilities the ability to manage a project. The end goal in both cases is the project itself that you are trying to deliver. It has multiple steps and phases, and requires the same leadership and motivational skills that I use with the students. I ended up making a career transition because of that. George: Absolutely, it goes both ways. Being a conductor has bolstered my leadership abilities, because I have to be a source of strength for all the orchestra musicians. When I stand there, if I'm not confident in my abilities, I will simply fail. The people skills that conducting needs are so important. In both positions as a conductor and as a project manager, you end up being someone who isn't doing the work itself--the conductor is the only person in the orchestra who doesn't make a sound (well, except for my accidental singing)--you are leading by motivation, by example. Karen: Do you still practice or perform on the violin? George: I don't practice or perform on the violin, but I pull it out frequently. I get it out to get parts ready for students and to run sectionals. And sometimes I sight-read chamber music, which I adore. Whenever I get the violin out, it makes me remember why I started playing the violin. It's a beautiful instrument. Karen: Who is your favorite composer? What informs your musical choices when you put together a program for the MITSPO? George: When I was younger, I would have said Brahms and Mahler. Now it's Beethoven. I really love a wide variety of composers and enjoy all kinds of music, but Beethoven is the composer whose music I've performed the most, and he is my ultimate favorite. There is such power in his music, and you can see how the orchestra's voice was liberated by him, even though his music originally used small forces. My violin teacher in high school said that I should discover the chamber music of Brahms, and my first exposure to that was his piano quintet. I fell in love with that, and that was my "Brahms phase." Then I went through a period of collecting CDs because that was a new medium for me. That was a whole new education, I amassed quite a large collection of almost 1500 CDs, and I was discovering hidden gems of the classical music repertoire. Karen: That's kind of what the Liszt Mazeppa is for this concert, right--a hidden gem? This orchestra plays a lot of big romantic symphonies that are well-known, but I'd never heard that Liszt before and it doesn't seem like most of the other players in the orchestra were familiar with it either. George: Yes, we tend to focus on late romantic works because of the forces we have available. And with this singular concert we want repertoire that is fun to play. Wagner and Liszt were related to one another, and they influenced each other very much. Liszt's orchestral music was far ahead of its time. He was a true visionary in classical music history. He was a piano virtuoso and pushed the boundaries of virtuosity in the orchestra. What attracted me to Mazeppa was its continuously furious intensity and brilliance. It pushes the entire orchestra to a concentrated level of effort. The reason I put this program together is that each piece has a kind of nationalistic fervor in its character. The Moldau especially is overtly nationalistic; the Mazeppa has the fanfare at the end. And Sibelius is very much a nationalistic composer; the last movement really shows that passion. All 3 pieces show different angles of that heroic element. It's a cool juxtaposition. Karen: How long do you think you'll be doing this? George: As long as I can. I really appreciate this orchestra. I've met so many great people with different personalities; each person has brought their own universe to me. It's even because of this orchestra that I met my wife. After I got the Longy position, I met her at Longy and she was Concertmaster of the MITSPO for a couple years. So I can say that my 2 children are the result of this summer orchestra. Next year will be the 20th season, quite a milestone. But it keeps you young! This was so great to read, Karen! I was in that IAP sight-reading orchestra and I loved seeing what George has been up to since then.